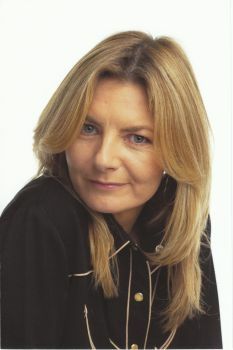 Now for those of you who are regular visitors to this site will be aware that we at one4review are big fans of the Stand Comedy Club, and this reviewer is also a huge admirer of Jo Caulfield too. So imagine my delight to see Jo and friends performing this different comedy night on which is sure to become a ‘must see’ monthly event. This is no normal comedy night. Hell no! Not 4 acts and a compere here, although we do have a selection of some of the best comics on the circuit appearing and of course Ms Caulfield as mein host is in charge, what we do have is, character comedy, sketches, impro comedy and even a excerpt of a comedy game show all linked with laughter and style by our impeccable hostess. Having done a successful warm-up of the enthusiastic Wednesday night crowd, she introduced the first double act, up and coming Gareth Waugh joined forces with his ‘dad’, the ever popular Vladimir McTavish as ‘The Third most popular Impro group in South Edinburgh.’ This was a nice and gentle set to get things moving, and engaged with the crowd from the off. The packed programme restricted them to a short spot but one that was well worth witnessing. Character comedy continued next as two penguins fro BBC One’s Nature programme graced the stage. These two chatting between takes had an interesting yet funny take of bird life, complete with penguin gags, yet well hidden in their costumes Jay Lafferty and Dee Custance played their slightly quirky set as only they can and there is plenty of scope in their set for development. Following the first interval Keara Murphy was the lady in the spotlight and showcased her comedy acting and mimicry talents while delivering a very funny and well written set on the history of women in TV. As always Ms Murphy’s stage presence is imposing and it was good to see her performing once again at the very top of her game. Close on her heels was a sneak preview of a game show that will be recorded in the New Year and featured Richard Melvin as host of ‘The Good, the Bad and the Ugly’. The game, similar in some ways to Dave’s ‘Argumental’, pitted the very considerable talents of Keir McAllister and Graeme Thomas presenting the case either for or against topics taken from the recent news, the winning argument being judged on audience reactions. This of course gave these guys plenty of scope to duel with each other and howls of laughter were the order of the day from the packed crowd. I certainly could have stood far more of this section. Heading towards the end now and following the brief second interval a teenage ghost, okay Eleanor Morton with a sheet and a baseball cap, had a few minutes of surreal humour prior to being dragged away by overbearing mother Jojo Sutherland. This I’m afraid was the only part of prceedings that for me anyway didn’t work, but they gave it a go, it was something that the concept of the night was designed to encourage taking people out of their comfort zone after all. All over then? Not yet!! We needed a review of proceedings, other than mine that is, and who better than those intrepid Impro all stars Stu Murphy and Garry Dobson. Employing their pet impro game ‘Should have said’. These two brought the show to new heights with an absolute hoot of a performance as the man from Radio 4 discussing with Aussie commentator Murphy the whole proceedings. At that was it. A long night, but an absolute belter. It was good to see so many weel kent faces doing things other than their sets. This had the enjoyment factor flowing from the stage too, it was almost palpable as they watched what their peers where getting up to. I feel that the concept of this show has a potential cult following, and I’m sure acts too will be queuing up to perform. As no doubt will the audiences too. I was forced by circumstances to miss the first couple of the series, a mistake that will not happen again I can assure you.